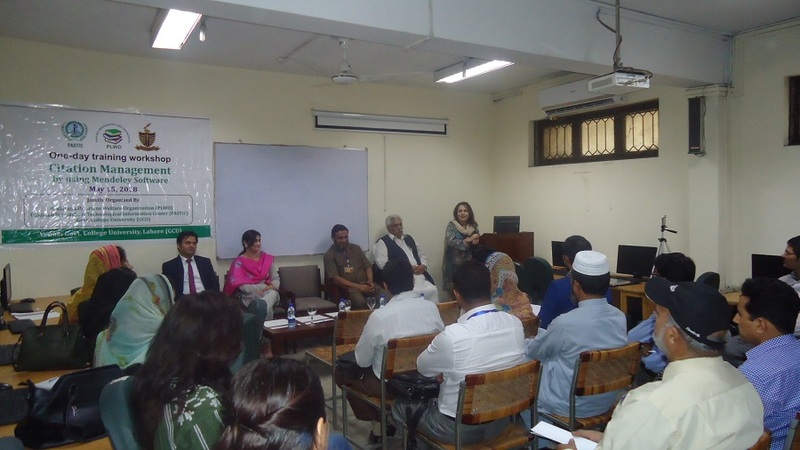 Pakistan Scientific and Technological Information Centre (PASTIC), Pakistan Librarian Welfare Organization (PLWO) and and Government College University (GCU) jointly organized a hands-on training workshop on Citation Management by using Mendeley Software on May 15, 2018 at Government College University (GCU), Lahore. The forty nine research scholars and faculty members of GCU attended the workshop. Mr. Muhammad Naeem, Chief Librarian GCU welcomed the participants and thanked resource persons for sparing their valuable time for the workshop. While talking on the occasion, Chief Guest of Inaugural session Ms. Irum Sohail Director, Quality Enhancement Cell (QEC) said that such training workshops are very necessary for the capacity building of the researchers. Mr. Zaheer Ahmad, E-Library Expert, Planning and Development Department was the resource person of the workshop. While highlighting the importance of citation management, Mr. Zaheer Ahmad, said that creating references and citing published work in research writing is one of the most critical areas in producing a well-rounded piece of writing. Adopting a specific style of creating references is increasingly being required by publishers. He said that Mendeley is one of the frequently used and the most popular open source free computer applications for citing and doing referencing. Mr Zaheer Ahmad briefed participants on various techniques of citation management using Mendeley software. He practically guided the participants about how Mendeley works and its different features. He also conducted a mock session to answer different questions raised by participants. Prof. Dr. Tahir Kamran, Dean of Arts and Social Sciences was the Chief Guest. In his closing remarks, he said that libraries are important cornerstones of a healthy community. He was of the view that students should spend their maximum time in libraries to increase their knowledge and understanding on various subjects. Dr. Kamran appreciated the role of library administration especially Mr. Khurram Shahzad in conducting the well representative and well managed workshop. He also distributed certificates among the participants and souvenirs to the resource persons of the workshop. 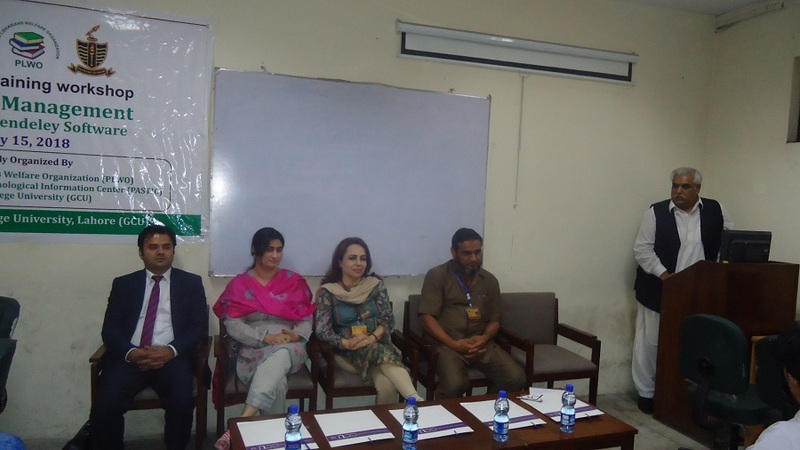 Chief Guest, Ms. Irum Sohail, Director, Quality Enhancement Cell (QEC), GCU. Talking on the importance of the workshop. Mr. Ali Raza Khan, Deputy Director (STI), PASTIC addressing the participants and highlighting the importance of the workshop.